A cluttered space and neglected appliances can cut down on your laundry room’s productivity and possibly create a household hazard. Follow our instructions for proper maintenance to keep your laundry room as safe and efficient as possible. It’s one of those little ironies: The laundry room often gets next to no TLC, even though we rely on it for the care and cleaning of so many of our other possessions. In addition to being the hub for dirty clothes, laundry rooms also act as a catchall for everyday items, which can quickly lead to a disorganized space. But laundry room clutter doesn’t just affect the room’s aesthetic; it can also impair the functionality of your appliances and lead to some real safety hazards. Here are some guidelines to help ensure that your laundry appliances and the space itself are in tip-top shape. Take note of all the nonessentials that have gradually accumulated in your laundry area and dispose of what’s not useful. For instance, if you’re collecting an Everest-like pile of rags, keep only enough to fill a small grocery bag and pitch the rest. Consider how you actually live, and not the special, sometime-in-the-future circumstances. After you’ve removed the obvious excesses, evaluate your stash of cleaning supplies. There’s a reason household chemicals are labeled with so many warnings. Minimize the danger by keeping only what you use, and trashing any products that have passed their expiration date. Organize what remains on shelving or in cabinets, being careful not to store reactive chemicals, such as ammonia and bleach, near each other. Also, be aware that flammable liquids must never be kept near a gas-fired appliance, such as a water heater, boiler, or furnace. Today’s washers and dryers are so user-friendly that homeowners often forget that they, like any other heavy-duty machine, need at least occasional—if not regular—maintenance. Proper upkeep will be rewarded with excellent performance, a longer product lifespan, and even peace of mind: According to the National Fire Protection Association, one out of every 22 house fires starts in the laundry room. But it doesn’t take much time or energy to stay safe. Here’s what to do. First, carefully inspect the washing machine hoses—both the hot and cold inlet hoses and the drain hose—for signs of wear. If they’re rubber, consider swapping them for more durable, braided-metal hoses. You should also consider equipping the drain hose with a strainer to keep debris from clogging the outflow. The component most likely in need of attention is the gasket around the washer door; its rubber needs to be intact and flexible to form a proper seal, so keep an eye out for cracks or tears. Depending on the age of your appliance, you may be able to find a suitable replacement at your local hardware store or home center. If not, contact the manufacturer. When it comes to the clothes dryer, you already know the lint trap needs to be cleaned after each use. 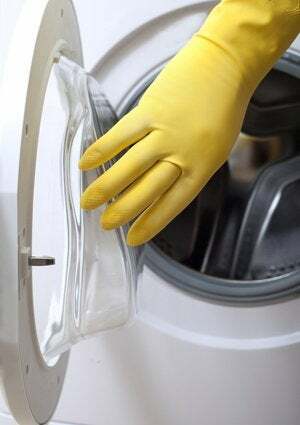 To remove stubborn lint, try using either a damp cloth or fabric softener sheets. Rinsing with warm water helps, too. Next, clear the exhaust by disconnecting the hose from behind the appliance and vacuuming out the buildup. To do a thorough job, consider purchasing a dryer vent cleaning kit—ideally one with a rotary brush that extends up to 12 feet. If your exhaust hose is made of either flexible plastic or foil, don’t hesitate to replace it with rigid or flexible metal ducting. Metal ducts have smooth interiors that resist the clogs that create so many problems, including fires. Believe it or not, the washing machine needs to be cleaned every so often, particularly if you own pets. When the interior drum is completely dry, vacuum using the brush attachment and then wipe down the walls. Residue from detergent and fabric softeners can accumulate over time, which can result in performance issues—and a foul odor. To combat this problem, periodically run the empty washer with a cup of white vinegar or liquid chlorine bleach instead of detergent. Finally, check the filters that sit where the hot and cold water inlet hoses meet the washing machine—you may discover dirt and limescale that need to be removed. To clean these filters, first unplug the washer and turn off its water supply. Next, disconnect the inlet hoses and, with a careful twist, remove the filters. After a soak in white vinegar, they should emerge good as new. Rinse them in cold water, put them back in place, reconnect the lines, and restore the water supply. 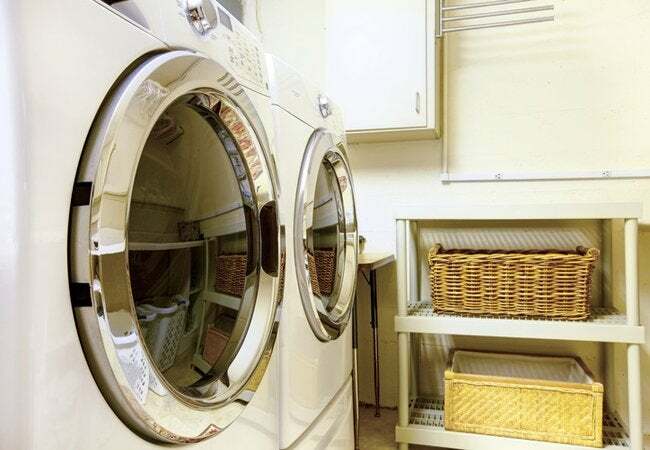 You should notice a performance improvement, but that won’t be the only payoff—with this little bit of regular maintenance, you can also expect your washer and dryer to last longer and cost less to run. Now, with your laundry area decluttered and your washer and dryer cleaned up and humming along, resolve to keep this hardworking space organized in the future for a safer, more-efficient laundry room.